The United States fifty-dollar bill ($50) is a denomination of United States currency. Ulysses S. Grant is currently featured on the obverse, while the US Capitol is featured on the reverse. All current-issue $50 bills are Federal Reserve Notes. The Bureau of Engraving and Printing says the average life of a $50 bill in circulation is 55 months before it is replaced due to wear. Approximately 3.7% of all notes printed in 2014 were $50 bills. They are delivered by Federal Reserve Banks in brown straps. The redesigned US fifty dollar ($50) bill incorporates two easy to use security features, subtle shades of blue and red, and historical symbols of freedom. Security features can help you to tell if a 50 dollar bill is fake or real. Tilt the bill to see if the numeral 50 in the lower right corner on the front of the bill changes colors from copper to green. The color shift is more dramatic in the redesigned currency making it even easier for people to check their money. Hold the bill to light and look for the watermark, or faint image, similar to the large portrait. The watermark is part of the paper itself and can be seen from both sides of the bill. Hold the bill to light and look for the security thread that is embedded in the paper and runs vertically up one side of the bill. If you look closely, the words USA 50 and a small flag are visible along the thread from both sides of the bill. The security thread glows yellow when illuminated by ultraviolet light. The redesigned $50 bill remains the same size and uses the same, but enhanced portraits and historical images as the older-design bills, and most importantly, continues to be recognized around the world as quintessentially American. The most noticeable difference in the redesigned $50 note is the addition of subtle background colors of blue and red to both sides of the bill. The background colors add complexity to the bills and differ with each denomination to help distinguish them. Because color can be duplicated by potential counterfeiters, it should not be used to verify the authenticity of the bill. The oval borders and fine lines surrounding the portrait of President Grant on the front and the vignette of the United States Capitol Building on the back have been removed. The portrait has been moved up and shoulders have been extended into the border. Additional engraving details have been added to the vignette background. The numeral 50 in the lower right corner on the back of the bill is enlarged to help those with visual impairments distinguish the denomination. The unique combination of eleven numbers and letters appears twice on the front of the bill. On the redesigned US fifty dollar bill, the left serial number has shifted slightly to the right, compared with previous designs. 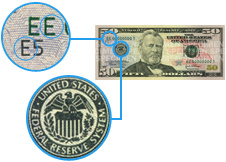 Because they are unique identifiers, serial numbers help law enforcement identify counterfeit notes, and they also help the Bureau of Engraving and Printing track quality standards for the notes they produce.